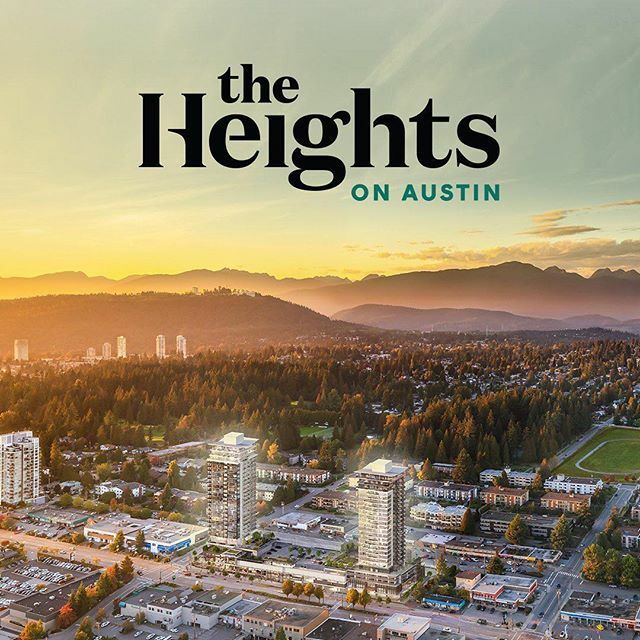 the HEIGHTS ON AUSTIN by the award winning Beedie Living launching soon. Located at Austin and Nelson in Coquitlam this 25 storey building will include 5 Concrete Townhomes, 1, 2 and 3 bedroom homes with sprawling views. The Heights embodies Austin Heights eclectic village vibe while utilizing its full spectacular surroundings with boutique shops, restaurants, parks and pathways all within steps of your frontdoor and a short distance from the Evergreen line. Premium Fisher & Paykel appliances, Quartz Counter-tops, Faber hood fan, air conditioning. 9' ceilings, laminate flooring throughout, entry niche, Grohe faucets, Concierge service, a 2,000sq ft indoor and 14,000sq ft outdoor amenity area (Lounge, Fitness centre, Green space with BBQ, Terrace, Children's area, Bike/car/dog wash station) and all homes come with 1 parking and 1 storage. Retail space below includes Safeway and an additional 15,000sq ft of storefront.